It is still summer in Sherbrooke. In fact, summer did not begin until late July, if not later. Yet, we will soon be fascinated by autumn’s palette of colours: shades of red, yellow, purple, burgundy: a study in vibrant colours. This type of scenery was depicted by members of the Group of Seven (see Group of Seven, Canadian Encyclopedia). And so was winter. Above is A. Y. Jackson’s Red Maple (1914), an early painting, but most of the paintings I am showing are winter landscapes depicting Quebec. Jackson was born in Montreal, and it would appear we all belong to the land of our youth. Born and raised in Montréal, A.Y. Jackson CC CMG (October 3, 1882 – April 5, 1974) first apprenticed taking evening classes at the Monument-National and the Conseil des arts et manufactures (Internet Archive) under Edmond Dyonnet (1896-99). He then studied at the Art Institute of Chicago (1906-07) and at the Académie Julian in Paris, under Jean-Paul Laurens (1907). He joined the Étapes art colony, a productive stage in his career. One of his paintings, “Paysage embrumé,” was accepted by the Paris Salon. 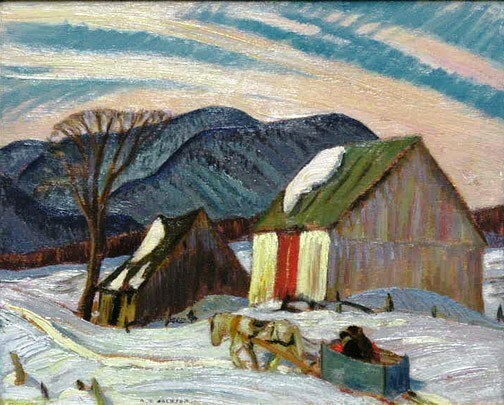 Therefore, A. Y. Jackson was an unlikely member of the Group of Seven, of which he was a founding member all of whom portrayed Canada’s wilderness. Matters changed, when Jackson exhibited his Edge of the Maple Wood (1910), shown below. 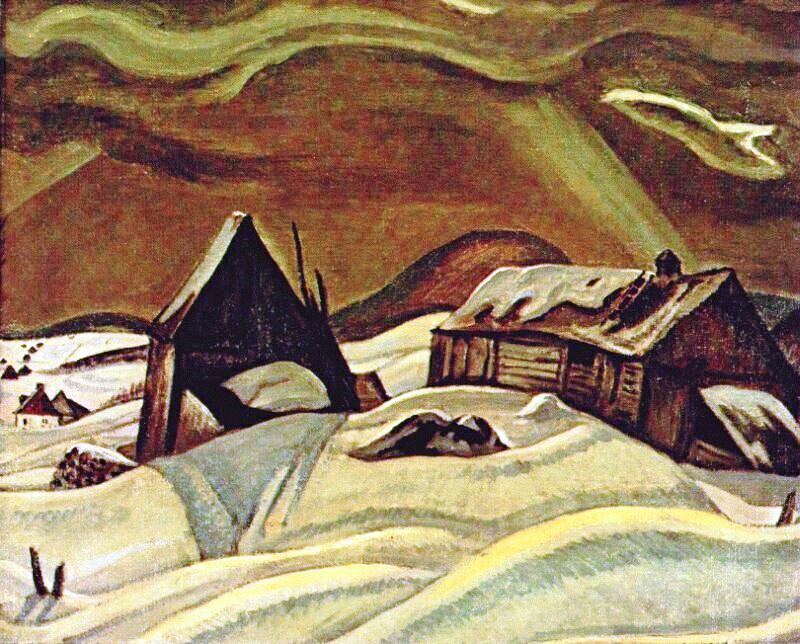 The painting drew the attention of the Group of Seven’s only wealthy member, Lawren Harris, who purchased it. Jackson could not earn a living in Montreal. Recognition worked its magic and induced A. Y. Jackson to move to Toronto where he first shared a studio with Tom Tompson (Canadian Encyclopedia), the artist featured in my last post. Jackson visited Algonguin Park, where Thomson built his cabin, loved its scenery and chose to be a landscape artist. 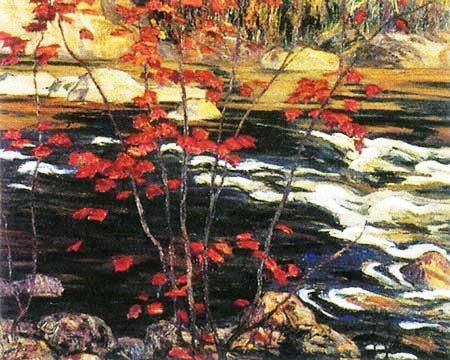 He also went west, to the Rocky Mountains, but by and large, he worked in Ontario areas associated with the Group of Seven such as Algonguin Park, the Algoma district, Georgian Bay and the North Shore (Lake Superior), etc. But Jackson also painted Quebec. A. Y. Jackson was a war artist (1917-1919). He taught at the Ontario College of Art, the current Ontario College of Art and Design and the Banff School of Fine Arts (1943-1949). 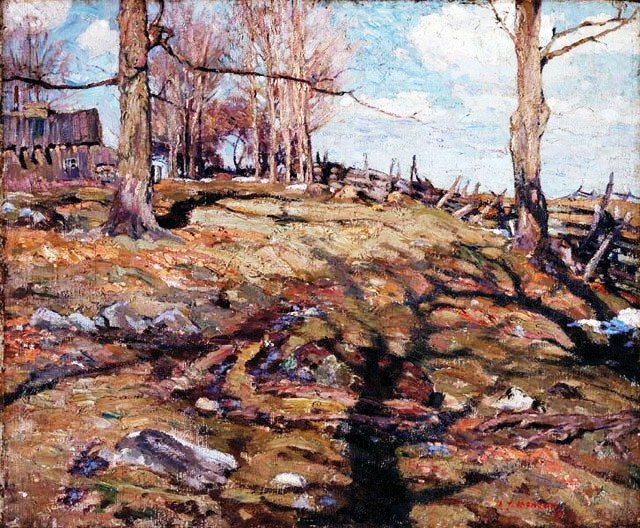 Later, he was artist-in-residence at the McMichael Gallery in Kleinburg, Ontario, where he died at the age of 91. 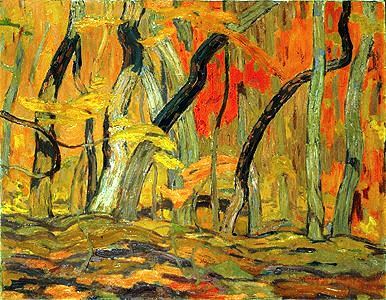 Members of the Group of Seven were Franklin Carmichael, Lawren Harris, A. Y. Jackson, Franz Johnston (replaced by A. J. Casson), Arthur Lismer, J. E. H. Macdonald and F. H. Varley. The group was formerly established in 1924 and 1925, but had held its first exhibition in 1920 at the Art Gallery of Toronto, now the Art Gallery of Ontario. The video we will view shows Tom Thompson, the Group’s precursor, as well as Emily Carr and David Milne, celebrated artists who also loved nature untamed.